An essential Tai Chi principle which is often espoused is moving the whole body as one unit, and like many concepts in Tai Chi it has a deeper meaning than on may imagine at first. For some it may refer to linking up all movement so it seems combined or unified. Making sure the lower half of the body isn’t separate from the upper half. This is true but this idea is only part of the picture and one can feel they’ve achieved the goal of “body as one unit” when their external form looks like it’s all one continuous movement to bystanders watching. However the meaning and function of this principle goes deeper and is more far reaching for our Tai Chi practice. This is because Tai Chi has many layers like the skins of an onion or a deeply plotted story of a book which then at the end reveals the essence of what it’s all about. Why do we want all our movement to be as one unit or look connected? Well not because by doing it means we get all the benefits from Tai Chi or that our Tai Chi is correct, but rather the reverse. When our Tai Chi is correct and beneficial our practice will be “body as one unit”. Similarly like some practices in Buddhism for example the result is the method of practice to a degree and we practice the result in order at times to backtrack the experience to correct any faults as a whole. However body as one unit means that the body is free of isolated tension to allow the smooth single wave of force/movement that is rooted in the feet; channelled up the legs; directed by the waist; discharged from the spine and expressed in the hands. To arrive at that state of practice more consistently we some times focus on areas of tension in our body to dissolve problem areas to clear the whole foot-to-hand pathway and thus allow the natural whole body movement unobstructed. Those tensions that block the way can be seen be viewed as debris on a motorway for example like maybe a tree that’s fallen onto the road or the result of motorway incidents that then slow down all oncoming traffic or even bring it to a complete halt. Injuries or isolated and concentrated exercises or lifestyle practices can contribute to these motorway blockages of the body if they go out of balance. Tai Chi and Qigong can be seen as the clearing up process of the motorway which frees up the traffic to move back to it’s natural speed and capacity of movement again. So does this mean we should only engage in Tai Chi when there’s a problem with this issue. 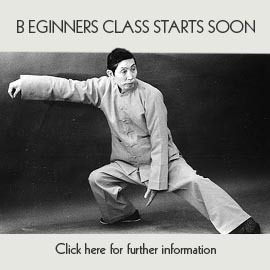 or only practice Tai Chi up until we do have body as one unit? All roads are maintained regularly and constantly ( although in Bristol you may be forgiven for thinking otherwise!) and thus the practice for clearing the road and regulating the traffic flow in our bodies should be a constant practice even when we have good health. This also allows us to analyse and maybe refine our practice to develop better and deeper ways to maintain the path and traffic in the body for the future and enhance it further. So in our practice we know the route all Tai Chi movement from ever posture takes therefore with our mind we can constantly run through the route as a fact finding mission to feel if there are any areas of stiffness or tension that regularly crop up. Doing this regularly everyday means we keep an eye on long term areas or difficulties that we can label as “under-construction” as we maintain our daily practice and new faults that occur that need attention. Once we recognise the area and issue along the route try to find the remedy/solution to it. If it is a facet developed through certain practices or postural off-sets then going back to the basic principles of central alignment, sung ( or sunk relaxation in the whole body) can help us in ironing out how the skeleton and muscles co-ordinate the flow of movement for many issues. Make you practice is regular of the remedy or antidote for the localised issue. Remember small amounts of constantly practice can bring about benefits quicker than large amounts done irregularly as Tai Chi’s benefit;s are considered to be accumulative and building upon repeated practice. Finally keep a watchful eye on how the practice is developing. Improvements in Tai Chi should never really feel like a surprise or an accident that has suddenly occurs (however this can be the case sometimes). The result is the practice and it logically does the job it is set out to achieve in terms of clearing the blocks and strengthening the traffic, so the benefits that manifest should be embraced. As mentioned this shouldn’t be done only when we are developing or have a specific health issue, but this should be done all the time and every time, every day. Constant practice may seem like a chore in order to receive the benefits of Tai Chi but in truth if we separate our Tai Chi from our day to day living of life it will seem exactly like that. Sometimes it may feel like once I get back to good health I can get back to enjoying my life and do the things I’ve always wanted to concentrate on for enjoyment and pleasure. However Tai Chi and its benefit’s ARE the pleasure of living life and are not a compartmentalised choice in life. They are one in the same thing and when Tai Chi principles are a habit they function the same way as breathing does for the lungs it is natural and doesn’t require any extra thought. When you have body as one unit you can realise and feel very clearly why it is essential to maintain it and the benefit of having it all the time every time you make any body movement. It makes sense why it’s good for whole bodily health; it makes fighting application’s in Tai Chi clear to understand and appreciate and it also allows the mind to transform its understanding in the natural interconnectedness of everything external to the body as well. As I said “body as one unit” isn’t about making the bodily movements look good enough to put out a DVD on Tai Chi and make it a best seller or to impress members of the public in a local park so that they view you as a guru or spiritually deep person. It is merely to be true in essence and clear away both the physical, emotional and psychological debris on the pathways to return back to free flowing internal traffic and get about with the business of being natural: all the time, every time you make a move in your life.